You may know them better as playhouses but most people in England also know them by their other name: Wendy House, but do you know where the name came from? It was first coined by J.M. Barrie in his 1904 play Peter Pan; or, the Boy Who Wouldn’t Grow Up (which was subsequently made into a novel and then the famous Disney film Peter Pan). The play features the character Wendy Darling who, after arriving in Neverland, was shot by the Lost Boy, Tootles. 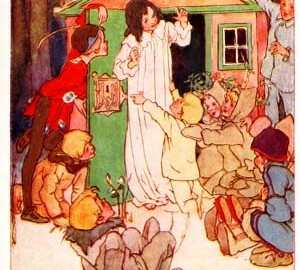 Peter Pan and his more loyal and caring Lost Boy tribe members then erect a small house around Wendy with the intention of creating a safe environment for her to recover. What are you wanting more? 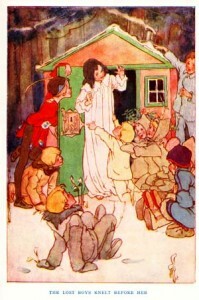 In 1914 the English illustrator, Alice B. Woodward created the now iconic illustration (below) of Wendy, the Lost Boys, Peter Pan and of course Wendy’s House. This set the precedent for many years of Wendy Houses appearing in British gardens so a massive thank you to J.M Barrie for this wonderful creation!